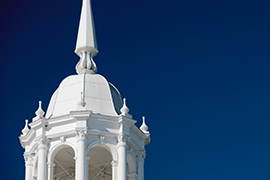 Stetson University was founded in 1883 with the vision of preparing students for lives of significance – times have changed, but our vision has remained constant. Our College of Arts & Sciences is dedicated to empowering real leadership that leads to significant lives since 1883. Our School of Business Administration is one of the few schools fully accredited in accounting and business in the world. Stetson University’s College of Lawis Florida’s first law school and is ranked in the top tier for both trial advocacy and legal writing. Our School of Music is fully accredited and is rated one of the finest undergraduate-only music schools in the country. Stetson students dare mighty things. They ask what’s possible, then they let their imaginations, competitive spirits and inquisitive natures propel them toward solutions that can remake the world. Stetson emphasizes active learning with a low undergraduate student/teacher ratio of 13:1. Sixty percent of classes have fewer than 20 students, and no classes have 50 or more students. Half of the first-year students finished in the top quarter of their high school graduating class. Which colleges and universities offer students the best value? The calculation used for this ranking uses a school’s academic quality and the net cost of attendance for a student who received financial aid. The higher the quality of the program and the lower the cost, the better the deal.